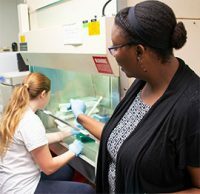 Roslyn Crowder, Ph.D., is working with biology students who conduct lab research, using plant extracts, in a quest to find cures for cancer. 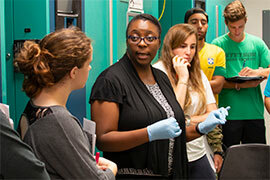 At the Sage Hall Science Center on the Stetson campus, first floor, tucked down a long hallway in a room that is cramped but filled with wide eyes, students — undergraduates — are exploring the world of curing cancer. They are researching cures for, yes, cancer. Making sure that happens is Roslyn Crowder, Ph.D., assistant professor and molecular biology program director. Crowder arrived at Stetson in fall 2013 after completing a postdoctoral fellowship at the University of Pennsylvania and Penn State Cancer Institute. Her postdoctoral research examined the molecular differences between human malignant cells and noncancerous normal cells to attempt to exploit these changes to cause selective cell death in cancer cells while leaving normal cells unharmed. That work continues today with her students, who are investigating the anticancer properties of plant extracts. Those students, eight of them in all, look both under the lens and into the future. Who knows? They could discover something that becomes really big in the quest for a cure. Or, more likely, they could uncover their own future. To help continue the research program itself, Stetson and Crowder have established a crowdfunding campaign, which can be found at https://experiment.com/projects/is-yaupon-holly-extract-an-effective-and-safe-way-to-induce-cancer-cell-death?s=discover. The campaign ends Oct. 20. The campaign’s budget items will be used to grow and maintain leukemia cells and normal fibroblasts. Additionally, bioluminescent and flow cytometry kits will be purchased for students to examine induction of oxidative stress in leukemia cells treated with new and old leaf extracts of Yaupon Holly. Under Crowder’s direction, the students’ one-semester lab research is part of a three-course program, which typically begins in the spring semester of their junior year. This fall, the eight students have been paired to compose four teams, with the goal of identifying anticancer properties in the extracts of two different plants types, Yaupon Holly and Alpinia zerumbet (a plant in the ginger family). Two pairs of students are focusing on Yaupon Holly, the other two pairs on Alpinia zerumbet. “We are trying to answer the question: Is the leaf extract, new or old, toxic to human cancer cells? We are hoping to try to find potential therapeutics that are specifically selective for cancer cells but leave normal cells unharmed,” Crowder explained. The research is very real, Crowder asserts, also pointing to hopeful future research about plant-growth conditions and their effect on the anticancer properties. Rachel Regester-Goumas, who will graduate in December with plans to attend medical school next year, agrees. “This largely connects with what I want to do with my future career,” she said. And perhaps a big discovery awaits. “The things that we can find here, the results, could lead to future medications and treatments. That would be amazing,” Regester-Goumas added. “But that’s not necessarily expected, because in research a lot of times the experiment you want to happen doesn’t always happen. To make a pledge as part of the crowdfunding campaign, go to https://experiment.com/projects/is-yaupon-holly-extract-an-effective-and-safe-way-to-induce-cancer-cell-death?s=discover.